If we combine the answers to all these questions, and recall that zero means very left-wing and ten very right-wing, we get the following results, summed up in Table 1, which shows average scores for strong supporters of the six parties. What’s worth noting straight away is that, with a couple of exceptions (namely, that on the ‘objective measure’ Labour supporters are more left wing than Greens and UKIP members slightly more left-wing than Lib Dems), the relative ordering on all three measures is the same: from left to right, it runs Greens, Labour, SNP, Lib Dem, UKIP, and Conservative. We also asked those strong supporters where they would place not just their own but other parties on the same left-right spectrum. Their answers are summarised in Table 2. We also include a mean score – one which excludes the score that supporters of each party give to their own favourite. Once again the relative ordering is very similar, except that this time UKIP are seen as the most right-wing party. What strikes one immediately is how ideology, like beauty, is in the eye of the beholder. For instance, we saw in Table 1 that diehard Conservative supporters locate their party at 7.82 on the zero to ten left-right scale. But, as Table 2 shows us, strong supporters of parties traditionally considered to be to the left of the Conservatives locate the party even further to the right. Keen Lib Dem supporters don’t see them as quite so extreme – partly because they are less left-wing than keen supporters of the Greens, the SNP and Labour, and partly, perhaps, because their party had spent five years in coalition with the Tories. Conversely, enthusiastic UKIP supporters think the Conservative Party is more left wing than its own enthusiastic supporters think it is. The same effect is observed at the other end of the spectrum: keen Labour supporters locate their party at 3.44, but keen Green and SNP supporters think it’s more right-wing than that (4.67 and 4.77 respectively). On the other hand, enthusiastic Conservatives are having none of it – to them Labour is far more left-wing than its own enthusiastic supporters think. Indeed, Tories think Labour (which they place at 1.98) is more left-wing than those Labour supporters think the Conservative Party is right-wing; they even see Labour as more left-wing than the Greens – perhaps not unreasonably given where our ‘objective’ score places them. Keen Tory supporters are also interesting in that, contrary to keen supporters of all the other parties, they think UKIP is less right-wing than they are – possibly because they realise many devotees of the ‘People’s Army’ are actually quite ambivalent about business and shrinking the state. If that is their suspicion, it is well founded as Table 1 shows. Enthusiastic UKIP supporters might see themselves as pretty right-wing when asked to place themselves on a left-right scale (6.77), but their underlying attitudes – the ones we tap into with our more detailed questions – suggest they actually sit to the left of centre (at 2.62). This difference between where parties’ strongest supporters place themselves is particularly pronounced but it is not unusual. However, it seems to affect left-of-centre and right-of-centre parties in different ways. As Table 1 shows, Labour, SNP, Lib Dem and Green supporters are, on that ‘objective’ measure at least, actually even more left-wing than they think they are, while Tory supporters, like UKIP supporters, are not as right-wing as they see themselves. When it comes to the latter, this is almost certainly explained, at least in part, by the fact that the ‘objective’ measure we use to determine left-right placement, although very much a standard one, only satisfactorily taps into the economic rather than the ‘social’ (or more specifically Green-Alternative-Libertarian/Traditional-Authoritarian-Nationalist) dimension. UKIP supporters are very possibly ‘welfare chauvinists’ with a populist (as opposed to class-based) antipathy toward big business. Perhaps, then, they are not so very left-wing after all. 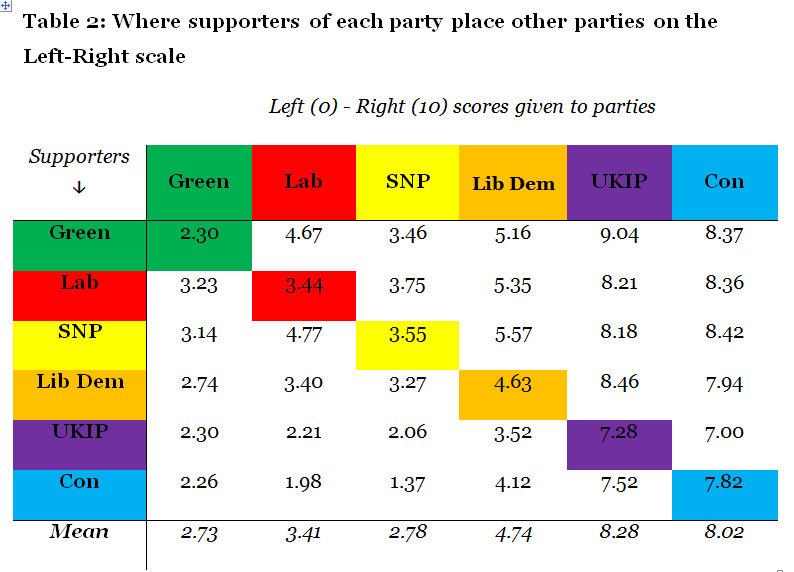 Finally, what does Table 1 reveal about the gap between where strong supporters place themselves ideologically and where they place the parties with which they feel such an affinity? First and foremost, it shows that it’s not that big – only 0.28 on average if you do the calculation – suggesting there’s no great mismatch to worry about. Just as interestingly, Table 1 also reveals that in the clear majority of cases, the parties’ strongest supporters see themselves not as more radical or extreme than the parties they support but actually as more centrist. There are only two exceptions. Keen Lib Dem supporters, as many of us might have guessed, see themselves as sitting to the left of their party, although the difference is very small. The real outliers, though, are enthusiastic Labour supporters, who not only see themselves as more left-wing than their party but as markedly so. One reason, perhaps, why Jeremy Corbyn won the Labour leadership contest last summer, and why he continues to command the affection and the loyalty of so many of the party’s biggest fans today, was that he was preaching to the already-converted. This entry was posted in Uncategorized and tagged Conservative Party, Greens, Labour Party, Liberal Democrats, party members, SNP, UKIP. Bookmark the permalink.